Click on the 'Events' menu and then on the 'Manage' button of the event where you wish to add attendees. 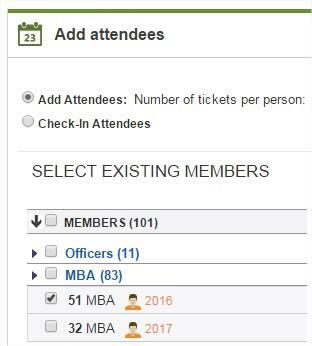 Click on the 'Add Attendees' button under the 'List of Attendees' part. From there, you can assign a number of tickets or check-in Members, Non-Members and Users who don't have a CampusGroups account. Add members to your event with the 'Select Existing Members' part. It is an easy way to add several members based on their student type and year of graduation at once. Add people with a CampusGroups account or not by clicking on the 'Add new contacts' button. Search and Add existing members or not with the Search bar. Add a list of people to your event by pasting the list of their email addresses.